2 October 2013 (Portland, OR)—Italian cycling clothing manufacturer Castelli has teamed up with Slipstream Sports, the parent company behind the Garmin-Sharp professional cycling team, based in Boulder, Colorado, and OpenHeartCO to create a special cycling jersey to benefit the communities affected by the recent floods. 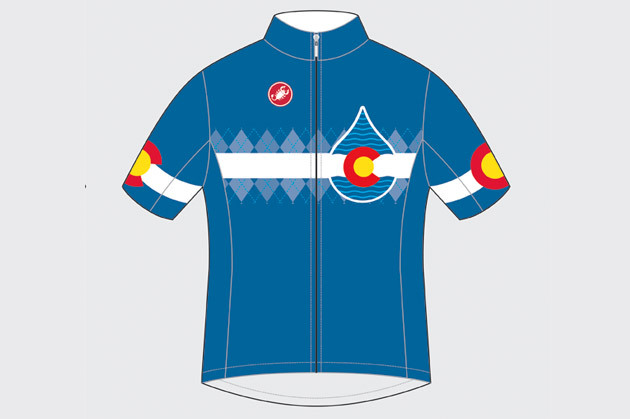 The proceeds from the sale of the Colorado Drop Jersey will be donated to Open Heart Colorado, which will be used toward health and human services for those affected by the flooding in Boulder and Broomfield counties. "We were devastated to see what happened in Colorado and we wanted to find a way to help our local community," said Jonathan Vaughters, CEO of Slipstream Sports, the management company behind top pro cycling team Garmin-Sharp. "Together with our partner, Castelli, we were able to come up with this special jersey and proceeds will be donated to help victims of the floods here in our home state. Our thoughts continue to be with all of those affected." The Colorado Drop jersey uses Prosecco Strada fabric for breathability and comfort. It features mesh side panels, inset sleeves for perfect anatomic fit, a full-length zipper, and three pockets on the back. The Colorado Drop Jersey may be purchased here.